For thirty years, the only human engagement with Area X has taken the form of a series of expeditions monitored by a secret agency called the Southern Reach. 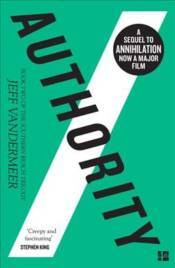 After the disastrous twelfth expedition chronicled in Annihilation, the Southern Reach is in disarray, and John Rodriguez, aka "Control," is the team's newly appointed head. From a series of interrogations, a cache of hidden notes, and hours of profoundly troubling video footage, the secrets of Area X begin to reveal themselves - and what they expose pushes Control to confront disturbing truths about both himself and the agency he's promised to serve. And the consequences will spread much further than that.